September 29, 2012 | Posted by Lee C.
With nights cooling off as fall gets underway, now is the time to transform your bed from a cool, airy summer oasis, to a warm, cozy, cuddly, winter den. One of the best fabrics available to help you make this transformation is flannel. Flannel originated in Wales and was widely used in the area since the 17th century. Since, then it has travelled to many other locations and takes various forms as warm shirts, pajamas and bed sheets. For a time, it was even used as sports uniforms in baseball and cricket. Flannel was originally made from wool. Worsted yarn created the soft textures and warmth. Today, flannel is also commonly made out of cotton or synthetic material. Textile Glossary discusses that cotton used for flannel, once it is woven, is napped, meaning the rough part is sheared away, on one or both sides. Cotton flannel is often napped before and after being dyed, creating an extra soft surface. After the cotton fabric is napped, brushing the fabric also brings out the fabric’s softness. Flannel is traditionally found in plaid patterns, but can come in various prints, as well as solid colors. If you are adding a winter sheet set to your bedding collection, it is not difficult to find a set of flannel sheets that will blend easily with your current decor. When shopping for flannel it can have various names. Flannelette is cotton flannel that is often only napped on one side. It is also sometimes lighter weight than regular flannel. Ceylon flannel refers to a blend of cotton and wool fibers. In short, if you need to warm up your bed for cooler, fall nights, flannel is an easy, soft, affordable option. Flannel insulates well and is soft to the touch. When purchasing flannel, be aware that the more times a fabric is napped or brushed the softer it will feel. 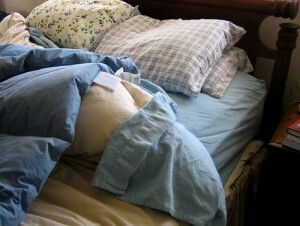 Combine flannel sheets with a down comforter and you can turn down the thermostat and have a cozy, fall night’s rest.